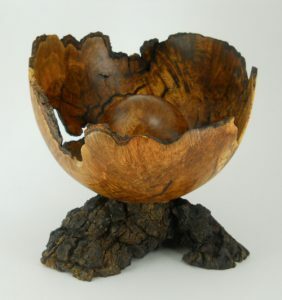 Augusta resident Dennis Curtis creates fine wood bowls and vessels from Maine timbers, all sourced from downed trees or salvaged woods. His exploration into unique and challenging forms often results in a revelation of complex, one of a kind formations of pattern and texture. “I believe that the occasional knot, bark inclusion, uneven coloring and asymmetric figure contribute immeasurably to the bowl’s attraction, therefore enjoy turning timbers others might think ‘imperfect’. Curtis has been a vendor at the Center for Maine Craft since 2009. His work is exhibited in various Maine galleries and shows, and he welcomes commission and custom orders. Visit the artist’s website.